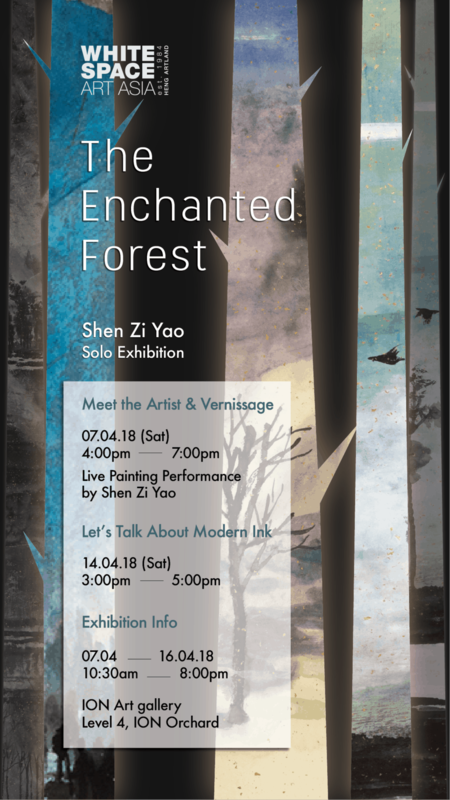 The Enchanted Forest is inspired by Shen’s midwinter and early spring visits to ancient forests and his experience of solitude in his travels. The forests are neither kind nor cruel and have existed far before the time of man. Journeying through The Enchanted Forest, the artist learns of the need to balance between his passion and the dispassion of nature. Incorporating elements of Western art such as perspective and lighting as well as a judicious application of mixed media to a classic Chinese medium, Shen Zi Yao’s artwork is a contemporary re-imagining of the Chinese landscape genre. Cascading arrangements of ink subtly masks forests and rivers and a poetic sense of abstraction suggests the immensity of all that lies between heaven and earth. Shen makes creative use of collage to redefine the concept of brushstrokes and space. The edges of painted pieces of rice paper serve as bold lines, spatially delineating patterns of ink. Shen Zi Yao’s bold vision is for his Chinese ink works to respond to the zeitgeist of western contemporary art. He seeks to step outside of the traditions that tightly binds many of today’s ink artists and to converse with a global audience. Distinctively Chinese at a glance, yet borrowing from and recognizing the hallmarks of western art, Shen Zi Yao has created a uniquely lyrical yet contemporary language. Shen Zi Yao will be present in person at the exhibition and will be carrying out a workshop to demonstrate his east-meets-west creation technique.